F. A. Hobson Landscaping are experts at the installation of “pavers”. 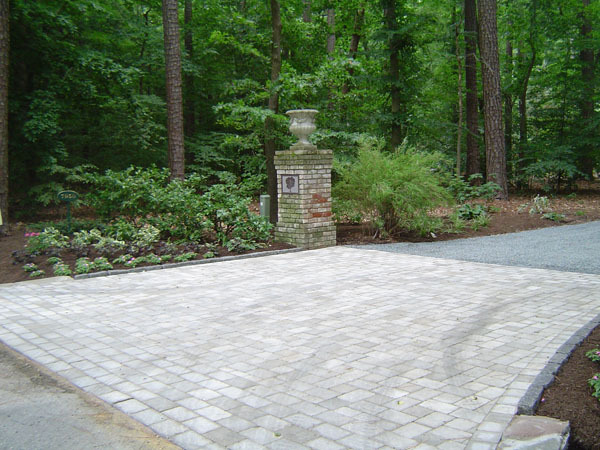 Brick pavers greatly reduce the amount of care needed to maintain high-traffic areas, such as driveways, patios and walkways. You can adapt brick pavers to highlight a formal home and garden, or use them to add atmosphere to a cozy cottage home. While built with greater durability than standard bricks, installation in high-traffic outdoor areas leaves bricks open to weathering and stains. If you add brick pavers to your outdoor space, you must follow regular cleaning and protective practices to keep the pavers looking their best. 1 – Sweep the pavers regularly to remove any surface debris, including dirt, grass clippings and leaves, which can not only stain the bricks, but block the sunlight so the pavers don’t fade evenly. 2 – Apply baking soda, corn starch or dry sand to any oil or grease stains on the brick pavers. Allow the dry ingredient to absorb the oil or grease for about one hour, sweeping the material once after 30 minutes, then sweep up the dry ingredient. 3 – Saturate the oil and grease stains, along with any other large stains, with a household degreaser and let sit for about 30 minutes. 4 – Prepare a mixture of hot, soapy water with a mild household detergent. 5 – Spray the entire brick paver surface with a garden hose, being careful not to spray away the degreaser. 6 – Scrub the entire paved surface with the hot, soapy water and a scrub brush — a long-handled deck brush works best, but you can use a broom instead. 7 – Scrub the oil and grease stains vigorously with the scrub brush to lift the stains; apply hot water as needed to clean the stains. A smaller scrub brush might be more effective at removing deep stains. Repeat until the stains disappear. Look for a special brick paver cleaning product if household cleaners and degreaser do not effectively remove the stains. 8 – Spray the pavers with a garden hose to rinse away all detergents. Allow the pavers to dry thoroughly. 9 – Sweep masonry sand into the cracks between the brick pavers, if needed, to replace any sand that washes away. Use polymeric sand that hardens after it gets wet to help prevent sand from dislodging between the bricks. 1 – Pour brick paver penetrating sealer into a paint tray or bucket; shake the can vigorously before opening. 2 – Roll the paver sealer evenly over the brick pavers with a paint brush roller. You must use enough sealer to absorb into the pavers without leaving streaks of excess sealer across the surface. 3 – Brush the paver sealer on the sides of the bricks exposed along the perimeter of the paved area. Allow about one hour for the pavers to dry completely. 4 – Apply a second coat of penetrating sealer to the paver bricks or, if desired, apply one coat of acrylic sealer. The acrylic coating protects against water, grease and oil stains. Allow about two days for the second sealer coat to dry before opening the pavers to traffic. 5 – Sweep the sealed pavers frequently to prevent stains from plant debris. Wash with detergent and a scrub brush as needed to remove surface stains. Reapply the sealer when the surface dulls to continue to protect the brick pavers against deep penetrating stains. FYI: Applying brick sealer is optional. You might prefer the look of worn, rugged bricks, but sealer is especially helpful for brick paver driveways.